More family-focused: new TVs and sleeper sofas added to treatment rooms on Units 2,3 and 4. Occasionally "treatment rooms" on Units 2, 3, and 4 are needed as an extra inpatient room when admissions are high. 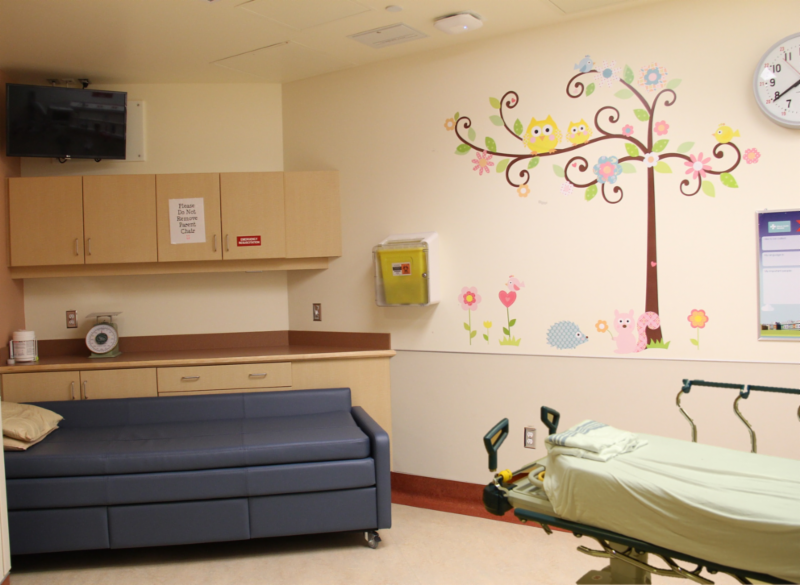 Since these treatment rooms were not designed for this purpose, it was important to make these spaces family friendly for both the patient and their family. "We are pleased to announce that all treatment rooms on these units have been updated and they now have sleeper couches for parents, an extra comfortable chair, built-in cabinets, and a TV. We are so grateful for the support from PFCC to make our treatment rooms more like home," exclaims Lenora Thorkelson, Manager Patient Care. The treatments rooms are interior, odd-shaped spaces that were designed to support procedure completion for patients on the unit. "Originally, nurses used these rooms for IV initiation, catheters, etc., because we wanted our patients and families to see their room as a "safe" place," explains Thorkelson. However, due to increasing admissions on these units, these treatment rooms sometimes need to be available as an extra inpatient room. "We are thrilled to make these spaces more family-focused like the other inpatient rooms," states Thorkelson. We appreciate your contributions, your investment of time (over 2800 hours this year alone!) 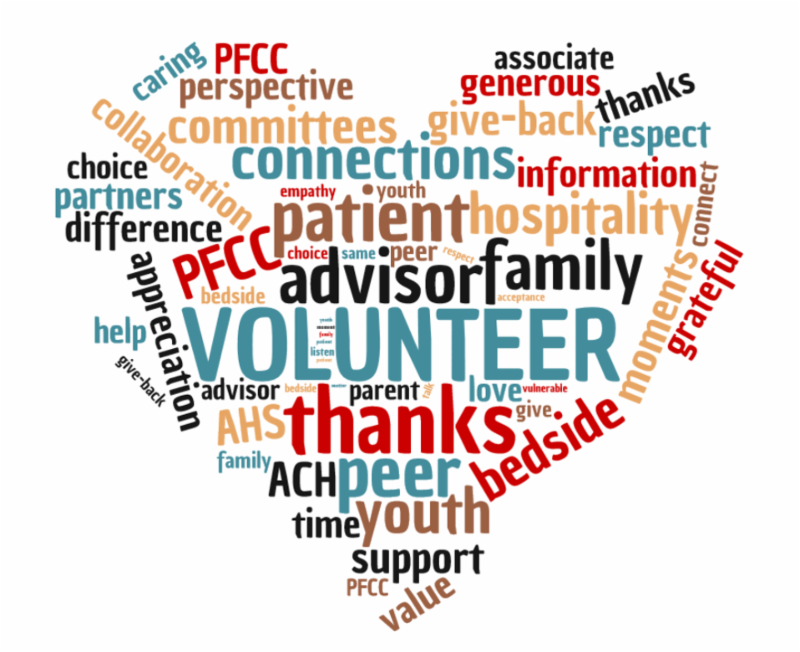 and your valuable experiences that you bring to your various PFCC volunteer roles. We've added volunteer roles in many areas this year including hospitality volunteers on the unit, our new Youth Transition Patient and Family Advisory Council, Bedside Connections in the NICU, and various committees and quality improvement projects. Thank you for your continued service and support of the Alberta Children's Hospital and all of our families. We celebrate YOU and we couldn't do what we do without YOU! We are looking for family members with inpatient experience at ACH to become Family Bedside Connection Volunteers. These volunteers provide information and support to newly admitted families. Commitment is to do a 2-3 hour shift on a unit, twice a month. 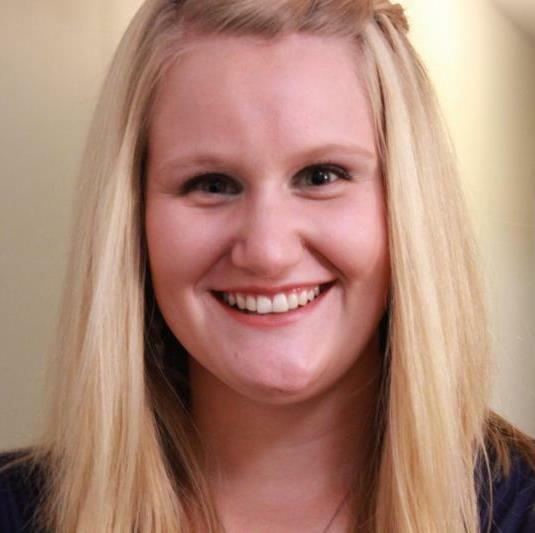 You'll see patient and family advisor and peer mentor, Justine Fehr, in many roles at ACH. She is on the Pain Committee, the Family Advisory Council, the Youth Transition Patient and Family Advisory Council, and visits families on Unit 3 as part of Bedside Connections. "Volunteering provides me a tangible way to give back to the healthcare system that has been an ever present force in my life. From anxiously waiting at Emily's Backyard as a sibling, to begging for a day pass to see the Dixie Chicks as a patient and then returning as a complex needs caregiver, my perspective on what makes up exceptional care is unique. This collection of experiences has provided me with a distinct voice that I hope will allow families to feel supported and heard along their medical journey." Many youth suicide prevention programs have been developed in response to this concerning trend. Many of these programs are intended to strengthen protective factors, which are those that reduce the risk of suicide. However, the majority of these programs to date have been developed and delivered to youth, rather than by youth.